Bought a new Raimondi Exploit 70 wet tile saw. I don’t really do enough tiling to justify the purchase but bought it anyway. Made in Italy, has a Festool feel to it. Tiling a bathroom floor this weekend, will try it out. After my last impulse buy (Wheeler Engineering gunsmith screwdriver set), I decided I wouldn't buy anymore cheap tools if there was any sort of alternative, and that I would begin systematically replacing the cheap tools I have. Ordered a Grace USA Gunsmith 24 Bit Magnetic Tip Screwdriver Set to make up for the Wheeler purchase and a Sturtevant Richmont F80-10 Torque Wrench 0-80 in/lb 1/4" Dr. off eBay since it was a fabulous bargain. I picked up a Woodpecker's 1281 square along with a 6" Incra t-rule and a hammerless nailset. Re: What non-Festool tool or workshop related gizmo/stuff did you buy today? Haven't purchased this yet but I did think it was some interesting stuff. The shot with the chainsaw is intriguing. "THANK YOU FOR SEEKING OUT BRAEÖN. YOU HAVE DEMONSTRATED SUPERIOR INTELLIGENCE BY BEING ABLE TO SPELL BRAEÖN! THAT PROMPTED THE PAINFUL PROCESS OF COMING UP WITH A NEW NAME…INTRODUCING...FORJ." I have an extension table coming tomorrow for my Hammer A3-31. Also some 8 foot lengths of Misumi Engineering t-track are scheduled for delivery tomorrow. Excited about both so I can continue working on my outfeed table/workbench project. As I’m sure several of us took advantage of some Black Friday deals. I ran to Home Depot to pick up some electrical parts and couldn’t pass up a DeWalt 20v cordless OMT kit. Tool, 20v 1.5amp battery, charger and a couple of blades for $99. I recently purchased a nice selection of 2" extended Torx drive bits from Apex Tools, made in the USA. Sizes 6 through 40. Very handy to have when those Torx screws are buried in a deep recess. While not being Centrotec, I do find Apex to be the longest lasting bits on the market. Better than Festool & Milwaukee and 10 times better than Dewalt & Irwin. I've never had one shatter, crack or break. They last for years. Purchased the SysLite Duo with the tripod from Bob Marino. Have a basement drywall and painting project coming up and looking forward to using it. darn that thing is bright. I am thinking about adding an in-line power switch to the cord close to the light head - bought one from Amazon for $8 that I may try. Got a tungsten sharpener from arc-zone built on the Milwaukee M12 platform. For use together? What are you going to use them for? Sounds like a lot of wide boards to me. No, the power feed is on the shaper. The stock PM tires are not that good. Needed the upgrade. Long story on the jointer. Not worth the bytes to explain. The W&H I bought used, the upgrades make it a better unit. Hey Tom, did you choose the straight blades or go for the helical head? Straights, it fit the budget. I finally purchased a bench. One of the first projects that I wanted to work on was a Benchcrafted Split Top Roubo workbench. I bought 2 hardware vise packages, the lumber, tools and equipment to build 2 benches but just haven’t got around to getting my equipment setup and start building one. I ordered the classic bench and hope to use it to build a split top and Shaker style bench in the future. I’ll update with pictures when I get the bench delivered and moved into my basement. 10mm SDS-Plus extraction drill bit from Heller tools. For an upcoming project. Nice Oliver...while at HD the other day, I noticed that Milwaukee, Hilti & Bosch are now also offering SDS bits with dust extraction holes. However they do command a premium price. They're around 4-6X the price of regular 4-cutter bits. Gundrilled holes don't come cheap. For me it's a live experiment. I want to see if I really can put in chemical anchors immediately after drilling the holes. Without blowing out residue. And I want to see how much residue (if any) will come out if I blow out the holes. If it works as it should/ as it its marketed - the 10mm extraction drill bit is well worth the 25,- Euro I paid for it. I bought a GRS from TSO Products. Its really the first after market accessory for festools that I have bought. I must say I really do like it. I just wish that there was a away to make exact repeatable cuts. If you use it with parallel guides you can. Festool’s won’t work because they occupy the same space as the GRS. The Seneca ones will work and I presume the Woodpecker’s as well. You could also make a “fence” that would mount to the GRS. I believe I saw that TSO was coming out with said fence. Do you know if that is metric or imperial? Id need metric for the LR32. Do you know how long it is? I know nothing...but I’ll bet Hans @TSO Products may have some info. I'll answer (based on squinting at the pictures Hans posted). Metric and imperial are on the scale and it looks like it will handle 30-31" wide rips (or xcuts) with the rail pictured. Thats pretty dog gone good. I was just thinking (which is the reason I came back here) that I wuldn really need an metric scale for theLr 32 as I use a metric tape measure (fast cap) that has marks every 32mm. So it wouldnt matter. PS: and thanks for honoring us with your first Non-FESTOOL accessory purchase - tip of the hat to you! Today I picked up a Dewalt 735 thinknesser, CigWeld 185A welder and a Makita 1019 scms. It was an expense afternoon! 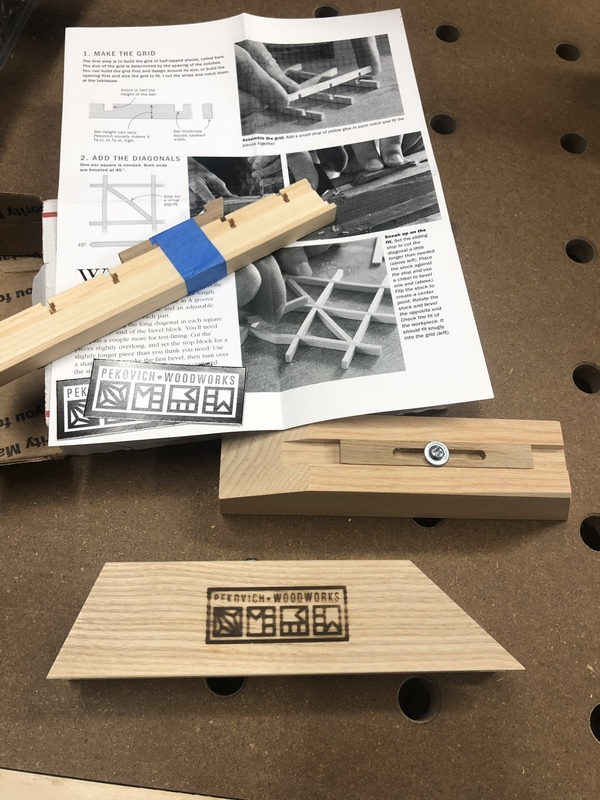 I received my Kumiko guide blocks from Mike Pekovich earlier in the week.